Cleveland Area History: The First of Cleveland's Follies? It’s true. Throughout our history, Cleveland has made some mistakes. Maybe a few more than our fair share. So could this elaborate mansion built by Samuel Andrews and vacated by his family after having been lived in for only three years, have started it all? In 1874, during Cleveland’s most prosperous time, John D. Rockefeller bought his partner Samuel Andrews out of the Standard Oil Company for $1 million due to their irreconcilable differences. Andrews had been hailed as an extremely capable mechanic and chemist. He developed the method to extract kerosene from crude oil, which is how he came to be in business with Rockefeller and subsequently assist in the formation of the Standard Oil Company. Andrews rose from near poverty into his newfound stature of wealth. Apparently he took the wealth and ran with it, living a rather grandiose lifestyle. He and his family lived on Euclid Avenue at East 28th Street when he made a deal to switch properties with William Bingham Sr. and planned the construction of his massive 18,000 square foot English Gothic mansion at the northeast corner of Euclid Avenue and East 30th Street. Today this is the site of the WEWS property. Each of Samuel Andrew’s seven children had their own room, and the home was apparently the first in Cleveland to have an elevator, which ran from the basement to the third floor. The home took three years to build, was lived in for three years, and then left vacant but fully furnished for 30 years. Apparently the logistics, layout, and maintenance costs of the home were not properly planned for and became quite a burden on both the family and staff of the home. Andrew’s dream of entertaining Queen Victoria (England was his country of origin) never came to be. 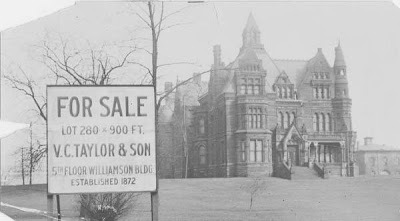 This photo on the Cleveland Memory website shows the home up for sale in 1917. The city’s Landmarks Commission website notes Walter Blythe as the architect for the structure, which coincides with Jan Cigliano’s Showplace of America: Cleveland’s Euclid Avenue, 1850-1910. This book is a must read if you enjoy learning about Millionaire’s Row. 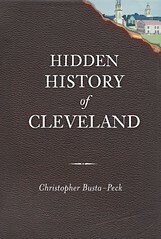 However in one sentence of this book, George H. Smith is noted as the architect, which matches the notation in The Encyclopedia of Cleveland History. I plan to research this further to find the correct information. Overall it appears that this structure and its fate was a result of the desire for maximum opulence. Form and function, however, must work hand-in-hand. My uncle Tom Barrow had a driving range on the old Andrews property between the demolition of the house and the coming of WEWS. There are photos. Are the photos online Bill? Please share! Yes, but it's a bit difficult to access, which is why I didn't provide a link before. If you go here http://academic.csuohio.edu/euclidcorridor/, then click on the segment labeled 3, then on one of the orange dots that appear in segment 3, then on the "Thomas Cooper Barrow.." link in the list on the left, then click on "View pictures and listen to audio" in the bottom right, you'll get there. I should just put them in Cleveland Memory and make it easier. Five of the shots are of the driving range, two were added by the Euclid Corridor history project people to show what was there before and there's a shot of Uncle Tom for reference. Let me know if that doesn't work. My God, I am entering a comment for a 4 year old post! "Showplace Of America" is jam-packed with errors, plus a lot of entries that do not make sense. You (Christopher) found this one. To my knowledge, there is no primary documentation that establishes Blythe as the architect -- only as someone who submitted a design that was rejected. 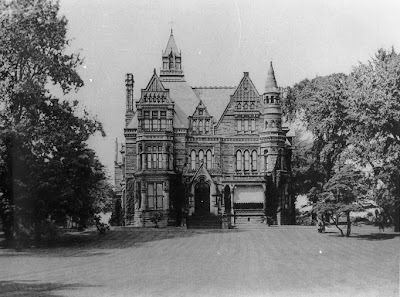 But, in an article about Cleveland architecture in the June 1902 issue of the Interstate Architect (published right here in Cleveland), a segment about Smith mentions that he designed the Andrews mansion. It appears that even Cigliano had found this (or something else making the same statement), but she got the story's "wires crossed"... as elsewhere in her book.